You already have a communication system! The communication system is one of the most important tools of leadership. Most mangers have got a number of channels that they use on a regular basis e.g. weekly meetings, Friday email, telephone conferences, newsletters, billboards, employee interviews etc. By organize the system properly you will improve the efficiency of your communication. In order to improve your system you need to understand and fully control the three components of the system. Lets go through them one by one. 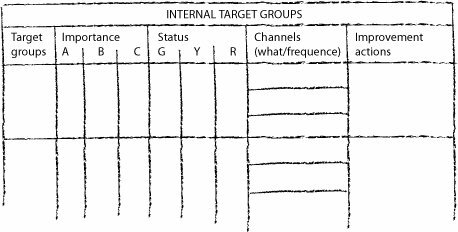 A good way to analyse your target group is by making a map of them. Who is in your map? The easiest way to do this is simply by draw a figure on a piece of paper like illustrated below. In this example we have chosen to divide the target groups in two categories; internal and external. You can chose any categories you want of course. 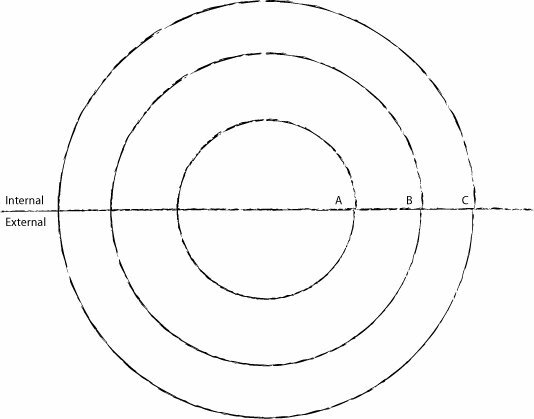 The circles indicate the level of importance (to you). The inner circle (A) is the most important. The third part of the communication system is the message. There are many ways to divide messages. You can think of it as one-way and two-way messages. The different is that the one-way messages are the kind of messages where there is no need for discussions or dialogue and with the two-way messages there is. You can also see it as a scale of importance for the target group. The more important the message is for the target group the more personal the channel needs to be. E.g. you should not send out an e-mail informing of a re-organization (this happens all to often) but rather organize meetings. Certain messages are difficult to talk about, such as feedback, vision, values and strategic issues whilst others are easy to talk about, such as project updates, financial issues, practical operative issues etc. This is why many managers use meetings to discuss simple messages (one-way) instead of important stuff that builds commitment and ownership. The absolutely most effective change in your system is to look at the messages you have in your department meetings and remove all one-way message to leave room for more discussions about the important stuff. Introduce a weekly e-mail (if you don’t already have that) where you summarize all the one-way messages. This will help make your meetings more interesting and to build a better climate and commitment.